Language of the American Crow, Corvus brachyrhynchos: Analysis. First Attempt to Analyze Crow Vocalizations: Early Morning Pre-Feeding Calls. 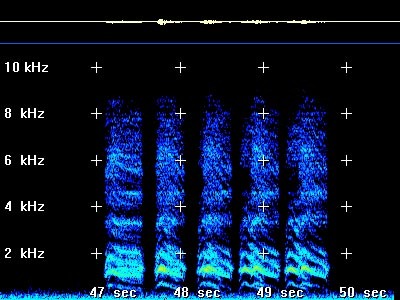 The two sonograms below represent two vocalizations, each consisting of a series of five caws, made by the same crow, with about 10 seconds elapsing between the two. These vocalizations were made on March 14, 2000 at 5:45 a.m.. Routinely, one or two crows appear at the feeding station very early, preceeding other groups of crows by as much as half an hour. 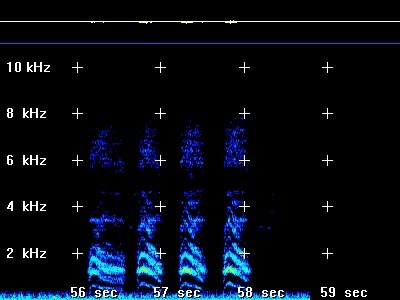 The first objective is to record the "Pre-feeding" calls of these early feeders over the course of several mornings, compare the sonograms of the vocalizations, and determine if there is a consistancy in the calls made over the several days. Click on the sonogram to hear the vocalization. 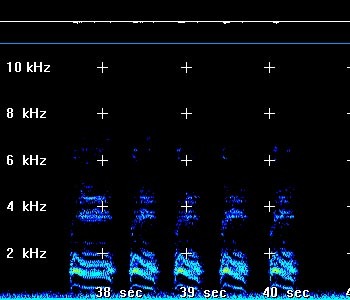 A visual examination of the sonograms illustrated above will show a great degree of similarity between the frequency patterns of the two sequential vocalizations. One crow arrived in the tree. It made a series of strident vocalizations as shown at the left. Another crow responded with a series of faint calls from some distance away. 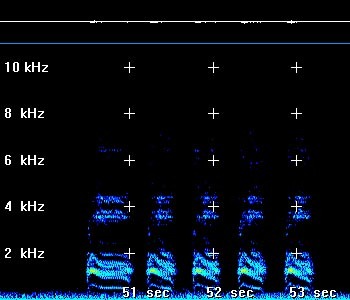 These vocalizations were barely audible in the tape and appeared only as blue dots on the sonogram. They are not illustrated on this page. The first crow responds by a series of three caws, as illustrated at the right, and the second crow calls again from a distance, but closer. 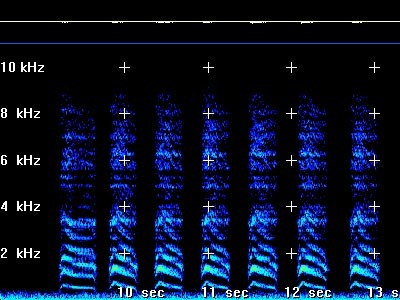 This sonogram, which appeared only as faint blue lines, is not presented. The second crow landed and the two birds cawed simultaneously (illustrated to the left). 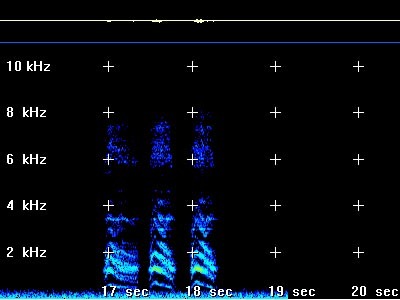 The calls almost overlapped completely, but if you listen to the recording, you should be able to distinguish a slight echo or reverberation at each caw. One of the two crows then vocalized several groups of caws, each of which has a cadence, volume, and frequency range more similar to those recorded the previous day. One of these groups is illustrated on the right. The cawing was followed by both birds descending to feed. Recordings of early morning calls were not made on March 16, 2000, due to overcast/rainy conditions which resulted in birds not arriving until much later in the morning than on the previous two days. Recordings were made on several subsequent days, and are in the process of being analyzed. When a potential danger is observed, crows will raise a warning with an "alarm call". These calls, which seem designed both to sound the alarm and harrass the potential predator, may be given by a single crow or a group and may vary in intensity depending upon the type of danger. The call below was given in response to a neighborhood cat who sometimes climbs to the crows' feeding station. This might be characterized as a "moderate danger" alarm call, given from the safety of a tree limb well out of reach of a "known" danger. The sequence of caws was aproximately twice as long as illustrated. Note: Sonograms and the associated sound files take up a great deal of space on the "server" and will sometimes be edited as to duration. © Copyright 1999 - 2009 Michael J. Westerfield. All Rights Reserved.